Jan. 22 (UPI) — Scientists have for the first time precisely calculated the temperature of heavy atoms in a supernova shockwave, a feat that could provide valuable insights into the nature of violent stellar deaths. Using detailed observations captured by NASA’s Chandra X-ray Observatory, scientists at Pennsylvania State University and the University of Palermo in Italy created a high-resolution simulation of nearby supernova remnant SN1987A. The supernova shockwave model showed even the temperatures of the heaviest atoms are directly correlated with their atomic weights. When dying stars collapse in on themselves, the rebounding effect expels stellar material at speeds approaching one-tenth the speed of light. The explosion sends a shockwave rippling across the surrounding interstellar medium. For astrophysicists, the most interesting part of the shockwave is the shock front, where the explosion’s extreme energy collides with slow-moving interstellar gas. Upon contact, the cold gas is suddenly heated several million degrees, causing the gas molecules to emit X-rays that can be measured by powerful telescopes like Chandra. By measuring and modeling the behavior of molecules just behind the shock front, scientists can glean new insights into the physics of shockwaves and supernova explosions. 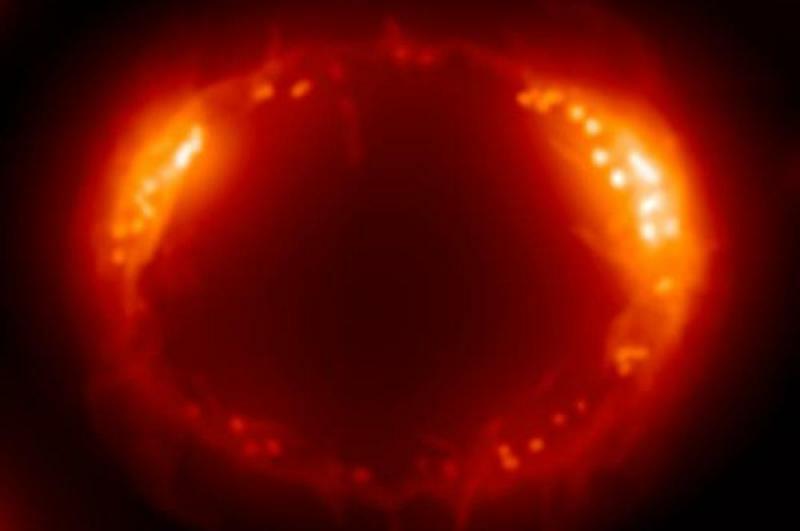 Light from SN1987A first reached Earth on February 23, 1987, and scientists have been studying the dramatic stellar death ever since, making it the first supernova to be studied in depth, as well as the longest continually monitored supernova. Unlike previous models of the supernova, which focused on single observations, the latest models — described in the journal Nature Astronomy — utilized 3D numerical simulations, accounting for the evolution of the explosion over the last several decades. Observations made by Chandra both helped scientists build their hi-res models and confirm that they were accurately estimating the temperature of heavy atoms inside the shockwave.